Two weeks ago I finally cracked and bought a Fuji X100. As someone who has used SLRs for the last 20 years, why was I interested in a £1000 compact? Quite simply there are times when I'm just shooting casually and don't want to carry an SLR, but I find traditional compacts, with their slow lenses, poor ergonomics and low image quality too limiting. Initial reviews were very critical of the firmware, but since Fuji made a major update a month ago that appeared to solve many of the issues, I decided to take the plunge. 2 weeks in and what do I think? First impressions are excellent. It is pretty to look at and very well made, with a fine metal body and beautifully damped manual controls. The shutter speed dial and aperture ring click reassuringly through their stops, and the optical viewfinder is clear and bright with a cleverly superimposed frameline and exposure information around the edges. Ergonomically the shooting controls of the X100 are very good. The aperture ring around the lens is easily controlled by your left forefinger and thumb, while the shutter speed dial can be set by feel with the camera to your eye. If you are using shutter or aperture priority there is a handily placed exposure lock button under your right thumb, and the exposure compensation dial clicks positively, It too can easily be set with the camera to your eye and and presents information on how it is set in the viewfinder. There is a programmable button that sits under your right index finger that can be set to ISO, so you can quickly change your ISO setting. There is also an excellent Auto ISO setting where you can select the maximum ISO and minimum shutter speed you are comfortable with. The X100 is primarily an autofocus camera, and a pair of overlapping rectangles in the viewfinder show the selected focus point, which flashes green when focus is locked. This pair of rectangles can be set in the menu system and are required to account for the parallax error between the viewfinder and the lens at close distances. It works very well. The focus point can be changed by holding down the AF button with your right thumb and using the 4 way scroll wheel with your right thumb. After a bit of practice it is quite easy to do while looking through the viewfinder. There are focus points across most of the frame. And when you download the images to your computer, prepare to be astounded. This thing is SHARP - even at f/2 and especially so at f/2.8 and higher. And noise is extremely well controlled at high ISOs. 1600 is excellent and 3200 is perfectly usable if the exposure is bang on. This is as good as a high end SLR. Sure it might be 12MP rather than the 21MP of my Canon 5D mark IIs, but in every other way it is at least as good. So far so good - this is all exactly what I was hoping for. However, it's not all plain sailing. Autofocus speed is not great and it sometimes locks onto the background rather than what I intended. I don't expect it to be super snappy, but something as fast as my GF1 would have been much better. Instead autofocus can feel a bit slow and deliberate. It also doesn't focus particularly close - around 50cm - and there are often times I wish I could fill the frame a bit more with my subject. It will focus much closer using the electronic finder, but I didn't buy this camera to use an electronic finder. And in very low light when any autofocus system will struggle, manual focus is very slow and frustrating to use. For whatever reason Fuji chose not to have a traditional manual focus ring on the lens, instead opting for an electronic focus ring. This in itself is not a great problem, my GF1 works the same way. But the focus ring on the GF1 takes an enormous number of turns to shift the focus even slightly, making it all but pointless in normal use. Then there is a slightly fiddly wheel on the back for scrolling through images and menu settings, as well as selecting flash mode, white balance, macro and drive modes. Most of these things I don't use very often, but it does make it all feel a bit like using a digital compact and is in direct conflict with the lovely controls and ergonomics on the rest of the camera. Next up, some of the digital controls are less than ideal and sometimes seem unnecessarily complex. For example there is a button for cycling through using the optical finder, the rear screen or both. A sensor will then switch between the two depending on whether you have it to your eye or not. Then there is a second button to cycle through what information is shown in the viewfinder and on the rear screen. The various combinations between these two buttons interact with each other and take a bit of getting used to. Another example is that if you set the camera to automatically review images after they are taken, it will display them in the viewfinder when you are in viewfinder mode - which is totally pointless, and interrupts your shooting. So I have this set to off, and just review images on the rear screen when I press the Play button. Finally, when you fit the the accessory lens hood (£80 extra, although there are knock offs available on ebay already) the lens cap and leather case no longer fit, which is just daft. So after all that what's it actually like to use? In a nutshell - the good far outweighs the bad. The actual shooting controls of the X100, the ones you use all the time, are a pleasure to use. Shutter and aperture controls fall nicely to hand, and the viewfinder is a joy to use. Autofocus is a bit pedestrian and I do sometimes miss shots from it, but most of the time it does a decent enough job. And finally, the images that come out of it are just lovely. 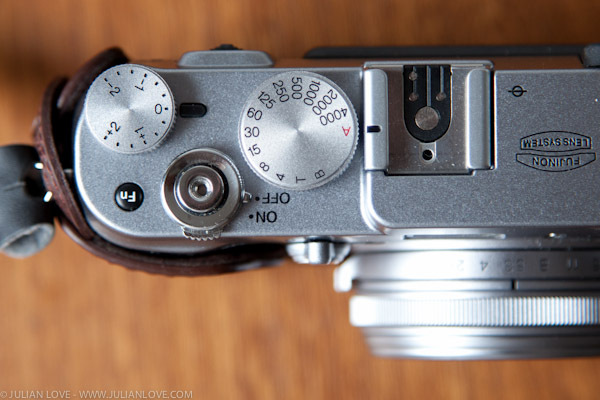 Many reviews have commented on how the X100 harks back to the golden age of rangefinders in the 1960s. However I don't think think that is quite correct and explains why some users are more frustrated with it than others. 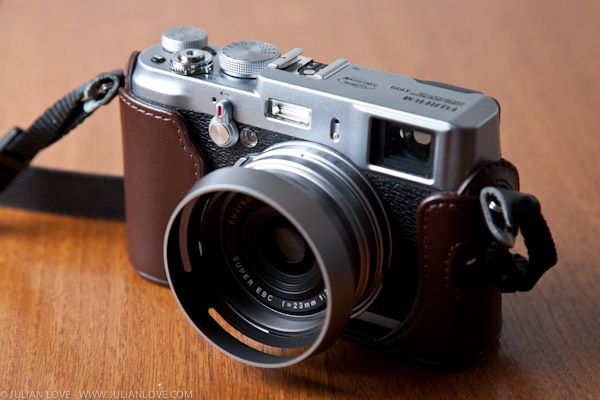 The X100 has been designed from the outset to be an autofocus camera, and should be used that way. Manual focus is an afterthought at best, and in that regard is more similar to a Contax G2. With a 35mm f/2 mounted the G2 even looks almost identical. For the last 18 months or so I've been using a Panasonic GF1 with a 20mm f/1.7 lens. It's a similar size, has a similar lens, and also has a large sensor in a small body. So how does it measure up to the Fuji which costs twice the price? When it was released at the end of 2009 the GF1, along with the similar Olympus Pen EP1, filled a gap in the market. They provided a large-ish sensor in a compact body with fast prime lenses. This was exactly the kind of camera I wanted for casual use, so I picked one up. However I soon realised how much I missed having an optical viewfinder, and the slipperiness of the body made it tiring to hold in my hand for long periods. To overcome these issues I pimped up my GF1 to include the optical viewfinder from the Olympus Pen - the field of view is about right for the 20mm lens, and I used some fine sandpaper to take off the silver finish leaving it black to match the camera. I also fitted it with Panasonic's half leather case which gave it a much better feel in the hand and made it easier to grip. - it has a very soft plastic shoe, so it easily gets knocked out of alignment while in your bag causing me to misframe shots. And when you do make changes to your aperture or shutter speed, you have to use a single tiny wheel under your right thumb that you have to click to switch between one and the other, and look at the rear screen to see what you have selected. 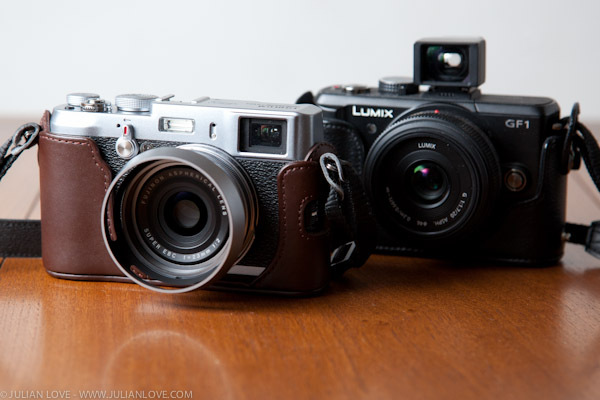 So the ergonomics of the GF1 are seriously compromised compared to the Fuji X100. It handles like a high-end compact as opposed to a fully featured camera. But what about image quality? While image quality from the GF1 is certainly a lot better than a compact camera, it is simply not in the same league as the X100. The 20mm lens is very sharp when stopped down just a little, and at low ISOs noise is well controlled. But by ISO 800 noise is very apparent, and ISO 1600 is very noisy indeed. At this speed the images lose much of their fine detail and and colours become muddy. Given the situations I tend to use these cameras, high ISO shooting is important to me. The GF1 does have some advantages - AF speed is superior and it takes interchangeable lenses. The first is indeed a genuine benefit, but the second is not that important to me for this kind of camera. So despite it's quirks, the X100 is a better camera for what I use it for. Ha ha - I've actually never quite got on with true rangefinders like Leicas and Voightlanders - so I think I'm safe for now! Thanks Julian for this informative post. I'm in the exact same position as you - in fact I just sold off the GF1 w/ 20mm yesterday. I loved the camera's responsiveness but just couldn't get the skin tones I wanted out of it. Also wasn't too impressed with the high ISO performance and its compressed highlights. 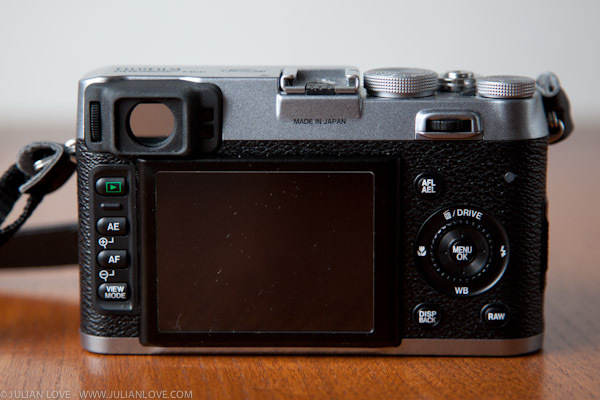 So are you still enjoying the X100 3 months after this post? I'm seriously considering picking one up. Hi Ted - yes still very happy overall with the X100. If you can live without lightning-fast AF then it's a great all round camera and a lot of fun to use. If I could rewind 3 months I'd still buy one. I hear the firmware updates make focus a little snappier--is this true? Mike I'm trying the new 1.2.1 firmware now. It does seem slightly snappier but not sure yet whether I'm just imagining it!